Yesterday I claimed that we are approaching the end of history in the NBA as the league progresses towards an era of family-friendly, fully realized superstars whose talents are so beyond question that they leave no room for debate or surprise. But the NBA still can surprise us, if only because the previous generation of stars has not quite left the building yet. Tonight Tracy McGrady made a stunning and indescribably poignant debut for the Knicks. Of all the teams in the league, no teams' games are as inconsequential as the Knicks. Of the current Knicks, only one, Gallinari, seriously figures in their future plans. (Chandler figures, I suppose, but not very seriously, and Lee may not be back.) They're simply playing out the string until free agency comes. It doesn't even help them if they lose; their draft pick is Utah's. I have no idea why Knicks fans watch the games. It's into this malestrom of meaninglessness that McGrady got traded, his contract the mechanism by which the Knicks could lure a second max player and thereby lure LeBron (since otherwise he'd be coming to play with absolutely nothing). In return for his cap-clearing services, McGrady gets to showcase his skills for the one NBA franchise that can afford to let an ex-star put on a purely self-seeking showcase. Some teams couldn't afford a successful showcase because they're trying to tank; other teams couldn't afford a McGrady showcase because he might shoot them out of games in efforts to impress future employers. 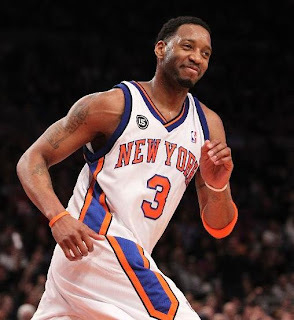 New York's the only team that could give McGrady this opportunity. It's quite a convenient confluence of circumstances. The same factors that make New York such an ideal destination for McGrady make McGrady's new home an ideal one for NBA fans. Because McGrady plays on the most meaningless stage of all, we're free to focus our attentions solely on his play, without any nagging concerns about the outcome of the game or the actual efficacy of what he's doing. It's star-watching without the guilt that usually attends star-watching, or at least attends star-watching for those of us who think that winning, rather than the soap opera-like clash of personalities and styles, is the most important thing in sport. So it was with great pleasure that I watched McGrady's improbably successful comeback. T-Mac is not back; athletically he's deteriorated to the point where he can't split a double team, blow by anyone, or even dunk for all we know. But he got to the rim somehow or another, finished with great accuracy, shot the ball well, passed beautifully, took only one bad shot, and managed to put up 19 by halftime. Not only did he look miles better than the shaky, diffident player we saw in spot action earlier this season in Houston, he played better than he did at any point last season, maybe even the season before that. Gone was the McGrady who spent most of his last years in Houston lazily launching arcless jumpers from the top of the key. Time and time again he went to the basket, in spite of looking even more hobbled than he did a year ago. I know it's only been a year since McGrady got real playing time, but I was almost reminded of Tom Watson's nearly winning the British Open two months shy of his 60th birthday, turning back the clock to his 30 year-old self in spite of very visibly being trapped in a 60 year-old body. Shades also of 'Mama Said Knock You Out.' At one point McGrady even shook his head at a defender who let him can a 17-footer in a gesture of "I'm still Tracy McGrady" pride. Perhaps the most touching part of the night, though, was when Jonathan Bender and T-Mac were on the court together. Bender's a veteran of the high school era; picked fifth in the 1999 draft straight out of Picayune, Mississippi (McGrady went ninth two years prior), he was touted as the next Garnett. He was a 7 footer with guard skills and immense leaping ability, shot the three well, and could block shots, a rare combination. But he never did figure the pro game out, became an injury problem, and retired four years ago, leaving only legends of what he did in practice, where teammates said he looked like the most talented player they ever saw. Then this season the Knicks unexpectedly signed him. In his comeback, he's shown flashes, but ultimately has looked even spottier than he did in Indiana. D'Antoni's using him primarily as an outsider shooter hasn't helped, and he didn't look particularly good last night. But there was a certain synergy between him and T-Mac, as seen on the play below where he gets the ball from McGrady, fakes the three and delivers a perfect pass back to McGrady under the basket that McGrady converts for his flashiest score of the night. Nothing could have been more fitting than the sight of these two players, both young men (30 and 28) who seem much older, trying to hang on to their careers in a league that's passed them by.